When making your eggs for breakfast, don’t throw out the eggshells! 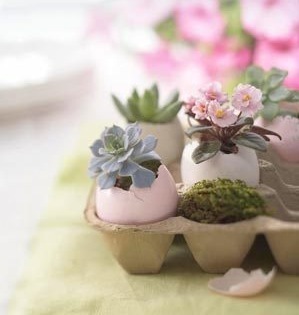 Even a broken egg shell can be used for fun children’s crafts! Grind the eggshells into a fine powder and place in a bowl. Mix the cornstarch with 1/2 tsp. cold water in another bowl, and in the flour and food coloring in the last bowl. Add hot water to flour/ food coloring mixture until it makes a thick paste. Mix all of it together and knead with your hands until combined. Roll into a stick and wrap the index card around it, securing with the rubber bands. Let dry for two days, remove card and let dry for two more. Separate your shells into as many piles as you need colors; ie., you need six colors so you make six piles of shells. Fill the bowls with dye or food coloring and color each pile of shells, then dry and set aside. Draw a picture on the construction paper, and let your child fill in with the egg shell pieces! Separating egg shells for more difficult crafts requires patience and care. For half egg shells, carefully break the egg open over the edge of a sharp dish such as a cereal bowl. Be sure to tap all the way around the waist of the egg and then gently pull apart. Rinse and allow to air dry. Removing the membrane is simple once the eggs are dry. When removing the top of an egg shell, tap in the very top of the egg with a fork and then carefully break away the pieces. Rinse and remove the membrane. This is a craft for older children or craft adults. Young children should use cardboard or styrofoam egg cartons. Color the egg shell halves with the dye, be sure to completely submerge so that the interior of the egg is colored as well (you will want to be sure the membrane that lines the egg is removed). Allow to dry , then tap a hole in the bottom and carefully insert a pipe cleaner. Place in a vase and you have a beautiful arrangement of eggshell tulips. Decorate eggshell however you would like to, if you want to. Fill the egg shell 3/4th’s of the way with potting soil. Carefully plant seeds according to instructions. Mist to water plants. Do not soak. Set eggs into carton, open side up. Dye egg shells according to package instructions. Melt wax and color with pellets or beads. Cut wicks 4 inches long and set into egg shells, then pour wax into eggshells with a funnel. One hardened, trim wicks and light!